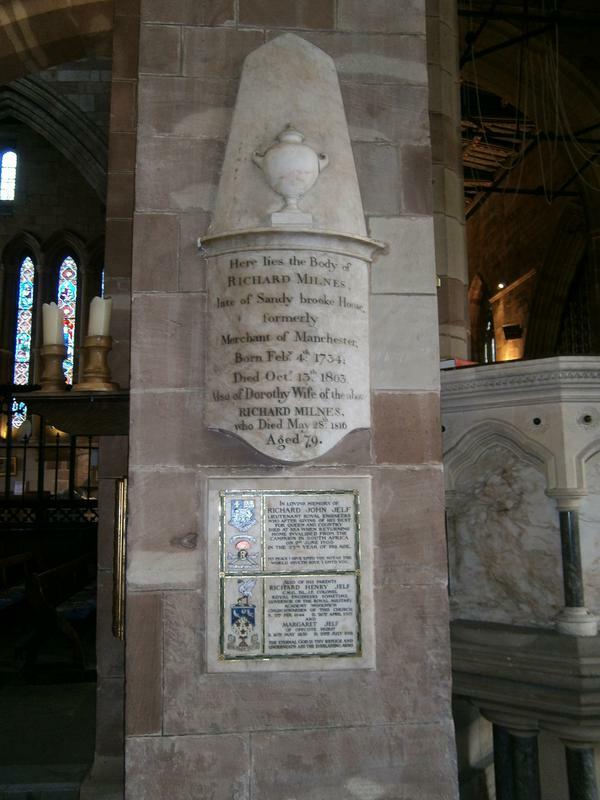 On the west face of the north column in the nave. 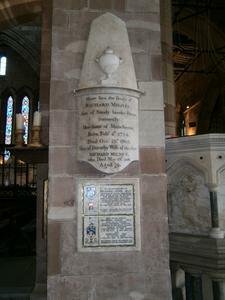 A white marble tablet comprising four tiles within a plain rectangular frame, each tile surrounded by a border of green and brown tesserae. 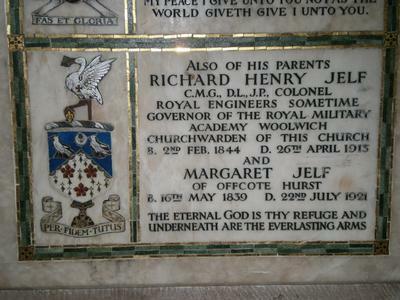 The two smaller left tiles bear painted coats of arms. The two right tiles bear the inscription painted in black upright capital roman lettering. 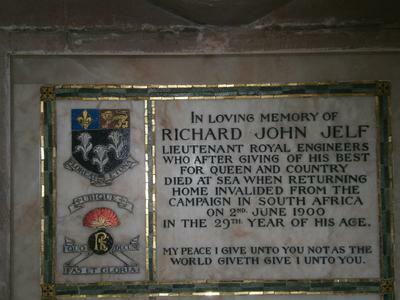 IN LOVING MEMORY OF / RICHARD JOHN JELF / LIEUTENANT ROYAL ENGINEERS / WHO AFTER GIVING HIS BEST / FOR QUEEN AND COUNTRY / DIED AT SEA WHEN RETURNING / HOME INVALIDED FROM THE / CAMPAIGN IN SOUTH AFRICA / MY PEACE I GIVE UNTO YOU NOT AS THE / WORLD GIVETH GIVE UNTO YOU. 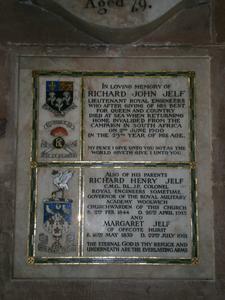 / ALSO OF HIS PARENTS / RICHARD HENRY JELF / C.M.G. D.L. J.P. 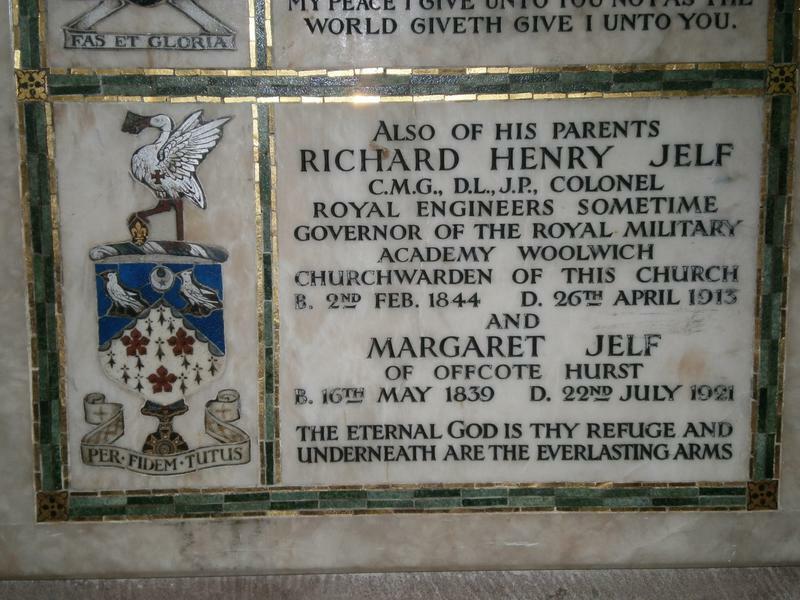 COLONEL / ROYAL ENGINEERS, SOMETIME / GOVERNOR OF THE ROYAL MILITARY / ACADEMY, WOOLWICH / CHURCH WARDEN OF THIS CHURCH / B. 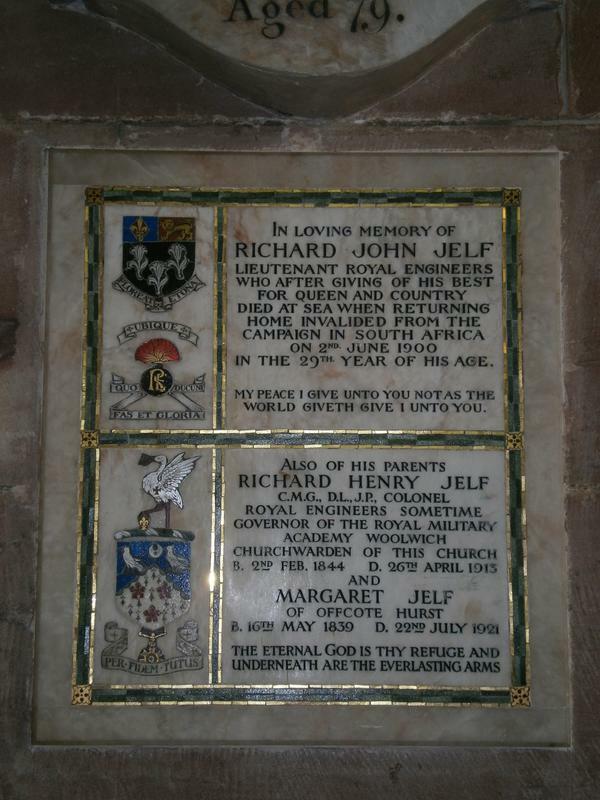 2ND FEB. 1844/ D. 26TH APRIL 1913 / AND / MARGARET JELF / OF OFFCOTE HURST / B. 16TH MAY 1839, D. 22ND JULY 1921 / THE ETERNAL GOD IS THY REFUGE AND / UNDERNEATH ARE THE EVERLASTING ARMS.